Win a Squirrel Buster FEEDER! Subscribe to our biweekly Digest of Bird News! Our biweekly online show is a digest of what is happening in the Avian World. Our site gives you the opportunity to showcase your bird photography and discuss topics important to you. 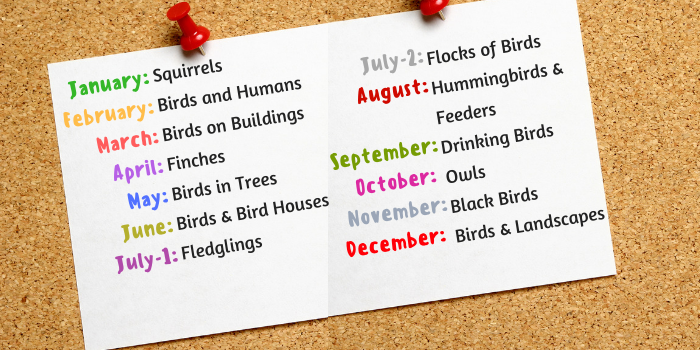 Our resident ornithologist Dr. David Bird will also answer any bird-related questions you have! The submission deadline is May 8th, 2019. The 3 Winners are announced on May 14th, 2019. This Contest begins on Tuesday, April 16th. You may upload 2 photos from Tuesday, April 16th to May 8th. You may upload a maximum of 2 photos per contest. You must be logged in to upload a photo. Uploaded photos will appear in the contest gallery once they have been reviewed by Brome Bird News. Pictures will go LIVE as they get submitted. The 3 winners (1st, 2nd and 3rd place) will be named on May 14th. The winners will not be allowed to participate for the 4 following episodes (2 Photo Contests).